Earlier this week, we highlighted The 20 Most Influential Academic Books of All Time, according to a recent poll conducted in Britain. Now comes the Syllabus Explorer, a new website created by the Open Syllabus Project at Columbia University. Impressively, the Syllabus Explorer has gathered 1,ooo,ooo+ syllabi published on university websites, then extracted and aggregated the data found in those documents, all for one reason: to determine the mostly frequently-taught books in university classrooms. 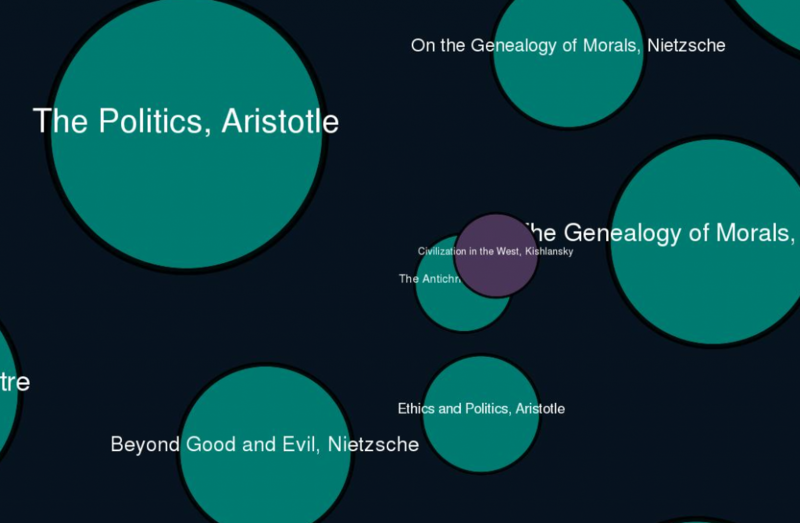 Writing in The New York Times, Joe Karaganis and David McClure, two directors at the Open Syllabus Project, explained that the Syllabus Explorer "is mostly a tool for counting how often texts [have been] assigned over the past decade." Using frequency as a proxy for influence, the Project assigns an overall ‘Teaching Score’ to each text, providing another metric for gauging the impact of certain books. It's worth noting that, despite its name, the Syllabi Explorer doesn't currently give you access to actual syllabi for reasons having to do with privacy and copyright. You only get access to the statistical aggregation of data extracted from the syllabi. That's where things stand right now. When you visit The Syllabi Explorer, check out this visual graph and be sure to zoom into the visuals. If you're a teacher, you can share your syllabi here. If you have money to spare, consider making a donation to this valuable open source resource. Minor correction, but the paragraph about Toni Morrison and the rest is about novels from the last 50 years, not novels in general. Frankenstein, Heart of Darkness, and The Great Gatsby all rank higher. Thanks Steve. You’re right about that. I adjusted the text. Your numbers have to be somewhat skewed. You have “Huckleberry Finn” and “The Adventures of Huckleberry Finn” listed as two separate titles. Those numbers should be combined into one listing. Free for the reading… only in Kindles or other electronic ways? An article posted about literature by, I assume, an English major that needs editing…blatant grammatical errors…what a shame. Where is the Bible in the list? Oedipus, by Sophocles, is listed twice under two titles, and if combined would make it rank at the #2 slot. Also, “to determine the mostly frequently-taught books in university classrooms”, is grammatically wrong. I think you mean to say “most frequently taught”. Oedipus The King is the title of the work, often reduced to just Oedipus. The story being a part of the trilogy, which continued with Oedipus at Colonus, and concluded with Antigone. There are other versions of the myth/tragedy by other authors, and some of them are called simply, Oedipus. Also been mentioned, but in the music section, the three largest points are all Stravinsky’s Rite of Spring, just spelled differently. Who should we tell to try to fix this? there are some parts of syllabi added now. for example, the ‘syllabus of the month’ at the moment has a reading list and some instructional material from a law subject about race issues from 1994 taught by a certain Professor Obama in Chicago. The book Ethics of Aristoteles is cited as one of the 10 most demanded books in American universities. But, except for deception, there are two books on ethics written by Aristotle: Nicomachean Ethics and Eudemian Ethics. What would be the Ethics book cited in the project? Nicomachean Ethics and Eudemian Ethics? Or were they both?